An Irishman who died in the New Zealand earthquake was 41-year-old Owen McKenna, originally from Emyvale in County Monaghan. He was married to a woman from NZ and had two children of primary school age. He trained as a nurse in London but moved to NZ after meeting his wife. 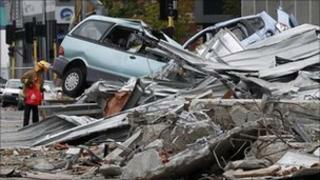 His car was crushed under falling debris during the quake in Christchurch on Tuesday. His mother and wider family circle still live in the Emyvale area. It is understood that Mr McKenna's wife was visiting her relations with their children when the earthquake struck. A priest based in the same Monaghan parish as Mr McKenna's family said they were drawing on their great faith in a time of great difficulty. "They still have to deal with a huge degree of uncertainty in terms of things like funeral arrangements so it is all very difficult for them," he said. BBC NI district reporter Gordon Adair said Mr McKenna had always made clear his wish to be buried in Ireland. Fabian Murphy, an old school friend from St McCartan's College in Monaghan, told the Press Association that he met up with the psychiatric nurse when he returned home for a short visit in July 2009. "He was as funny as ever. I have known him since we were four-years-old," Mr Murphy said. "He was one of the funniest people ever, even in 2009, the night's craic we had was just like old times. At least 75 people died in the quake and about 300 are still missing. The New Zealand government has declared a state of emergency. Construction worker Paddy McGowan from Killygordon in Donegal was in an internet cafe in Christchurch when the earthquake began. He said that he went outside and quickly became aware of how much devastation had been caused. The trained lifeguard ran to help people trapped in a nearby shop, rescuing a man and a woman. "The man was unconscious. We kept doing CPR on him, but the guy had passed away," he said. Just a few minutes later, he was directing people away from another potential danger. The primary focus is on rescuing survivors buried beneath mounds of grey rubble. Some of the major office buildings in Christchurch were virtually flattened in the earthquake. It has been a slow and delicate rescue effort, using both heavy lifting equipment and hand tools. The rescuers have enjoyed some success, pulling at least four survivors from one collapsed office block. One woman was brought out after 25 hours spent crouching under a desk. With sporadic aftershocks impeding the rescue effort and shaking already badly damaged buildings, there have also been fears for the structural viability of one of the tallest buildings in Christchurch. With the death toll expected to climb further, the New Zealand government has declared a national state of emergency. "I could smell gas. I went to the nearest junction and tried to stop people walking through," he added. "When I was standing there, I was looking around and could see fires burning and it was quite scary, quite unreal. "It didn't really sink in." He and some friends later tried to drive out of the city but turned back because the roads were so busy. Rescue teams in Christchurch have been combing through the rubble searching for survivors and the government has declared a national state of emergency. An emergency number has been issued for those concerned about friends and family in Christchurch. The number to contact in New Zealand is 00 64 78 50 21 99. The Foreign Office is also offering assistance to British citizens who have been caught up in the earthquake in New Zealand. The number to call 020 7008 8765.